This summer sailors on Lake Ontario will see an exceptional new multihull take to the water. This Catamaran, which has been built near Toronto, pushes back the boundaries of performance cruising further than has ever been attempted before. Furthermore this boat is intended as a test bed for an exciting new range of yachting instruments manufactured by Tektron Equipment Corporation, and will therefore provide more data than has ever been gathered on a multihull before, in terms of rig and hull stress against performance on all points of sail, and sea states. 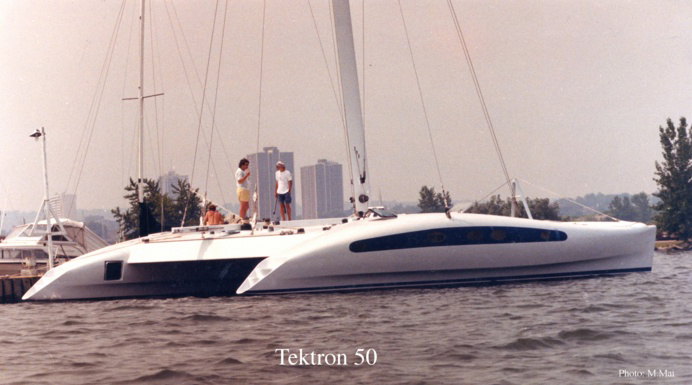 After tuning up on Lake Ontario, the Tektron 50 is entered in the 1988 Quebec-St Malo race. The aim of the design was simply to produce the fastest posssible 50' yacht with reasonable accommodation. No restrictions were placed on the use of all the latest technology for the rig and hull. Multihull design and construction techniques have advanced so much in the past 5 years that we can now design a 50 ft cruiser/racer that will be faster than a 60 ft racing trimaran like Fleury Michon VI (OSTAR record holder). The overall drag of a modern multihull has been reduced to a level where reduction in the aerodynamic drag of the boat above the waterline will contribute significantly to improvement in windward performance. When you consider that in a cruising boat like this that has full standing headroom in the hulls, and the underbody of the boat below the waterline has a draft of only 18 inches, it is obvious that in order to achieve good accommodation and excellent windward performance very careful attention has to be paid to the aerodynamics of the boat above the waterline both forward and aft. I consider the aft streamlining of the boat to be of great importance because the wake that the boat drags along behind it will cause as much, if not more drag, than the effect of the wind striking the front of the boat. To acheive this the whole boat is designed with a very rounded form, and the cockpit and crossbeam structure areas as aerodynamically clean as possible. All the deck edges have generous curves and even the primary winches are set below deck level. Flare in the hull creates the interior volume needed for comfortable cruising, without increasing the frontal area at all. By designing the hull and deck entirely on the computer using computer graphics and 3D modelling techniques, we were able to produce a very streamlined and advanced hull form for both the under and above water shapes. The computer is able to draw sections through the boat at any angle, therefore we were able to study the air flow across the hulls at the angle that the wind actually flows across the boat. This is of great significance, because the wind never strikes the boat from dead ahead when you are sailing - in fact it will be 25 degrees off the bow at best. Tank testing was carried out on the hull to provide a yardstick for future designs and to facilitate accurate performance predictions. The tank test model and the tank set up at the Wolfson Unit in Southampton can be seen in the tank test photographs above. The eliptical shape of the leech of the mainsail is designed to reduce the loads in the top part of the sail and to allow faster de-powering of the sail in gusts. The mainsheet tension is controlled by a 12000 lb hydraulic ram built into the boom. It is not possible to build a mainsail as powerful as this in Dacron, because the massive leech loads would soon stretch a conventional sail behond the point of recovery. Therefore the mainsail is being built by Hood Sails in England using a combination of Kevlar, Mylar and Spectra 900. The jib, made by Randy Smyth, is self-tacking, and fully battened, allowing extremely close sheeting angles for maximum windward performance. The boat is designed to be extremely stiff so that the forestay can be kept as straight as possible, with the tension higher than would normally be used in an equivalent sized racing monohull. This is achieved by both the mainsheet tension and the twin running backstays. Downwind sail wardrobe consists of two assymetrical spinnakers (by Smyth), which will be gybed like a genoa. These are set on a pole permanently rigged to keep them well clear of the mainsail. The wing mast has been designed to have the smallest area possible and yet still provide an efficient leading edge to the sail. In the open ocean it has been found to be extremely dangerous in a gale if the area of the mast is too great, and at least two maxi-multihull capsizes can be attributed to being overpowered by their masts. In order to reduce the extremely high compression loads in the mast the main halyard and drifter halyard are on a two part purchase. This also reduces the overall stretch in the luff of the drifter which is set flying. There are two steering stations that each position the helmsman has the hydraulic controls of the mainsail and two wheels. The other one steering the boat and the inner one steering the mast. The idea is that the mast cannot only be easily trimmed, but by means of an auto-pilot hooked into the system and fed by a wind vane at the masthead, the mast can automatically self-trim to the perfect angle to the wind at all times. This should make a significant difference to the upwind performance. The boat has been built by Eugene Tekatch at his factory near Toronto in Canada and for the first five months of the project the building team was led by two very experienced boatbuilders from Cowes in England. Eugene is intending to use this boat as a test bed for a new range of instruments that can be used on all yachts to allow skippers to compete against the maximun performance of their own or any other boat. In order to gather the information required to produce the computer plots, Eugene will be covering the boat in electronic sensors fed to an on-board computer which will gather information on everything including rigging tension, wind speed and direction, boat speed, sea state, etc, etc. The first seasons sailing will be spent gathering data and during the following winter computer analysis of the results will provide the information required to produce the plotter curves against which they will sail in the following season. There is no doubt that this design pushes the performance limits of a cruising boat further than has ever been attempted before, and it seems likely that if you consider that this boat will be faster than the OSTAR record holder Fleury Michon VI, by nearly 10%, it is not idle speculation that this will be the fastest cruising boat in the world. With everything possible being done to achieve outstanding windward performance, and a top speed of over 30 knots, the Tektron 50 is going to be a very exciting boat to sail. Yet the four comfortable double state rooms, a saloon that seats eight people, a large galley, full sized chart table and workshop, and a deck area where 40 people can party in comfort, still give the boat excellent cruising potential. This type of design makes sense to many people who would like to race and yet do not feel inclined to invest so much money in an all out racing boat that has a limited life span, and worse still, a low resale value. By designing the Tektron 50 with good interior volume and clean aerodynamics, I believe that we can fulfil the requirement for outstanding performance, and yet retain a high value as a fast cruiser for many years to come.